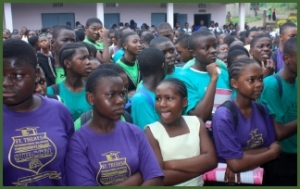 Students and teachers from St. Therese International Bilingual College Buea, Salvation Bilingual Comprehensive High SchoolBuea, Government Technical High School Buea and Holy Child College Buea get to know more about the Democracy Incubator Project of the Southwest Region. 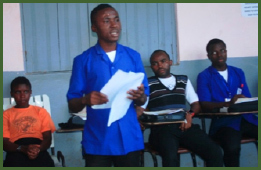 The launching of the “Democracy Incubator” (DI) Project for the South West Region took place at St. Therese International Bilingual College, Buea from the 27th – 29th October 2014. 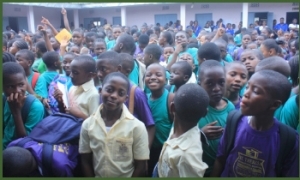 The launching project comprised: a coordination meeting with selected schools; a training of trainers’ seminar and an official launching ceremony. The launching program started with a coordination meeting with representatives of the selected institutions and DI Project assistants on Monday 27th and Tuesday 28th October 2014. 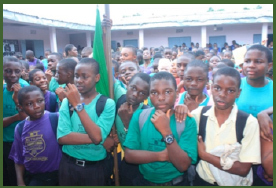 The selected schools were: St. Therese International Bilingual College Buea, Salvation Bilingual Comprehensive High School Buea, Government Technical High School Buea and Holy Child College Buea. These meetings provided an opportunity for teachers and students representative of the selected schools to get to know more about the project and to discuss the implementation plan. In his launching speech, the representative of the Regional Delegate for Secondary Education for the South West Region,Mr. 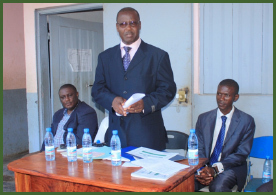 Njikang, lauded the initiative of CADAC and called on the selected institutions to effectively implement the project in their various institutions. He also assured CADAC of the support of the Regional Delegation of Secondary Education to the DI Project in the South West Region.